The short wait was worth it for Kirkwood Mountain ski resort, which opened Saturday, Nov. 24 with 30 inches of fresh snow for skiing and snowboarding. Thanks to 30 inches of snow this week, Kirkwood Mountain had good conditions for its season-opener Saturday. Kirkwood Mountain’s opening brings the number of Lake Tahoe ski resorts open for the 2018-19 season to six. Other Tahoe ski resorts open are Squaw Valley Alpine Meadows, Heavenly Mountain, Mt. Rose and Boreal Mountain. Kirkwood Mountain kicked off the 2018-19 season with a 6-inch blanket of fresh snow, which fell over the previous 24 hours. Lifts started spinning at 9 a.m. with eager skiers and riders lined up at the base, awaiting first tracks. 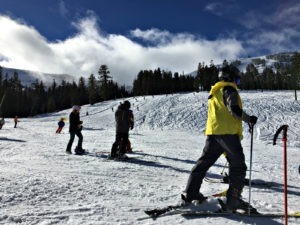 The resort, located off Highway 88 near Lake Tahoe, had originally planned to open Wednesday, but pushed back the date four days due to the expected snow. Passholders were treated to free breakfast sandwiches. Also on the schedule for opening day were snacks and ski-and-ride gear giveaways. In the afternoon there was live music in the Kirkwood Village. All retail outlets, on-site lodging and a majority of the Resort’s restaurants were open for business serving drinks and food. Welcoming skiers and riders was Kirkwood’s new Vice President and General Manager, Tom Fortune. He joined Vail Resorts (which also owns Heavenly Mountain and Northstar California) in 2010 and most recently served as Senior Director of Mountain Operations at Kirkwood. “I am extremely excited about my new and expanded role at Kirkwood. It’s such an amazing mountain with an incredible team of people,” Fortune said. “Kirkwood truly is a special place to hold this position. Kirkwood opened with the following lifts and terrain. Snowkirk Chair running with access to beginner terrain on Snowkirk and Hay Flat, from top to bottom. Solitude Chair includes access to intermediate terrain on Outlaw (formerly Racecourse), from top to bottom. Off-piste intermediate terrain is available on Lower Zachary, Lower Monte Wolfe, Mokelumne, and advanced terrain on Lower Olympic. The new Cornice Pizza makes its debut in the Kirkwood Village. The inspiration comes from the 1980’s with newly installed neon lights and bold colors, preserving the lively spirit of this Kirkwood staple. The menu includes unexpected pairings and traditional favorites, with plenty of build-your-own pie options. Squaw Valley has received 25 inches of snow this week and opened additional terrain Saturday. More terrain at Squaw Valley Alpine Meadows: The upper elevations received up to 25 inches of snow in this storm. Gold Coast Express lift opened on Squaw Valley’s upper mountain, with access to intermediate terrain and views of Lake Tahoe. At Alpine Meadows, Nick’s Run opened for more intermediate terrain off of Kangaroo chair. Heavenly remains closed: It’s been a frustrating Thanksgiving holiday weekend for the famed South Lake Tahoe ski resort. High winds kept the resort closed Thursday and Friday. Expecting to open Saturday with skiers and riders anxious to test out the 25 inches of snow over the past few days, the resort remained closed due to frost forming on the Tamarack chairlift.